"How did Flyin' Fred Curry get his nickname? This is how. Fred rocks Joe Nova with a devastating flying dropkick - his favorite maneuver. Bull instructs his son on one of the finer points of the sport. Even Fred was amazed at how much his father knows about scientific grappling. 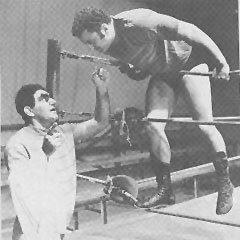 "He'd be just as great if he wrestled clean," Fred said about Bull.